Sparklers and other novelty fireworks are legal in Ohio, but the State Fire Marshal’s office warns Ohioans to use caution when using them. 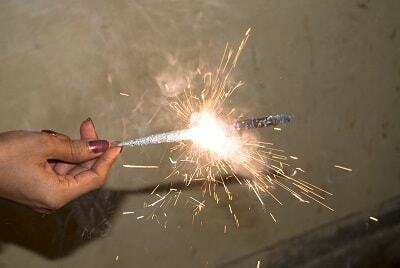 Thousand of people are treated each year across the country for fireworks-related injuries. COLUMBUS – It can be fun to make a bang with fireworks when celebrating Independence Day, but the State Fire Marshal’s office has a grim reminder for Ohioans. Not only are most fireworks illegal in Ohio, they’re also quite dangerous, according to Chief Josh Hobbs, head of the Fire and Explosions Investigations Bureau. Trick and novelty fireworks are legal in Ohio, and include sparklers and “party poppers” – items that can be purchased at local supermarkets or drug stores. But Hobbs warns there are risks when using them, and he encourages Ohioans to use caution and always have a water source nearby. According to the Consumer Product Safety Commission, there were eight fireworks-related deaths nationally in 2013, and hospitals treated more than 11,000 people for fireworks-related injuries. Hobbs says many Ohioans are too focused on obtaining fireworks and having a celebration, instead of considering the impact on others around them. Hobbs adds there’s a lot at stake for what some consider a little fun. A person violating the state’s fireworks law can face a first-degree misdemeanor, and a penalty of up to six months in jail and a fine of up to $1,000 if convicted.